This short walk circles Camfield Place, the country estate of the late Barbara Cartland. 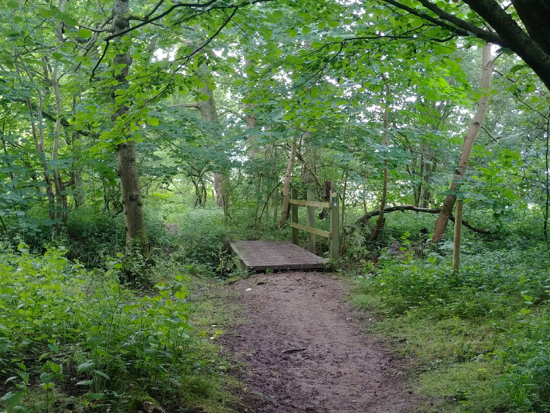 It takes you through five woods, down tree-lined footpaths, across a footbridge and down quiet country lanes. The journey ends with the possibility of a drink at The Woodman at Wildhill. Check the opening times, especially on a Sunday, to ensure you are not disappointed. If you are going to end up drinking at The Woodman, you can park in the pub car park, if not, park in the lane near the pub. Park your car towards the top of the car park. On your left you will notice a gate just beyond the beer garden where the car park widens. This is Hatfield footpath 85. 1: Enter the field and walk uphill and diagonally south-east across the field heading slightly to the right. This can be muddy after rain. This field often has horses grazing and they can be frisky. You will notice a gate in the hedgerow ahead. Go through it and enter a field, often sown with various crops. 2: Head straight across this field to the edge of woodland. 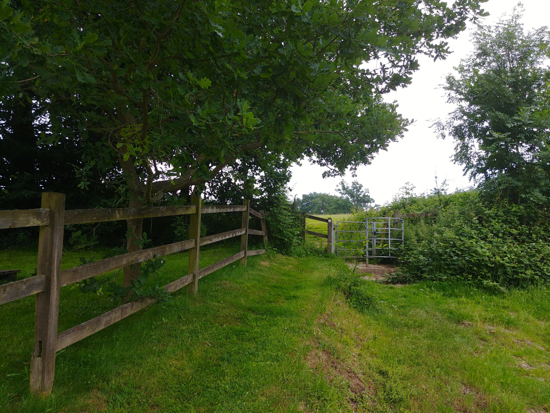 Here you go through another gate and, keeping the wood on your left, walk along the edge of the field still heading south-east. 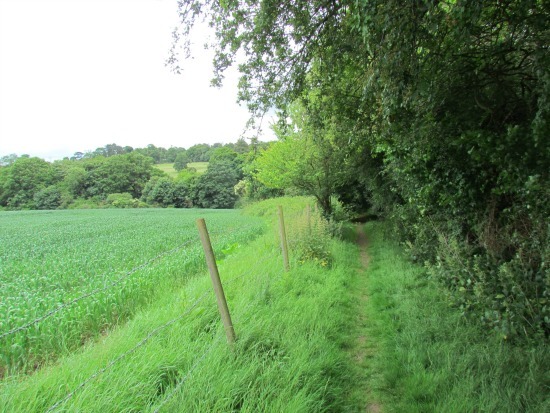 3: The path is usually cut diagonally across through the crops to a gap in the hedgerow leading to Kentish Lane. 4: You need to cross the road here and turn left, walking north-east along the right-hand side (east side) of Kentish Lane (the B158). 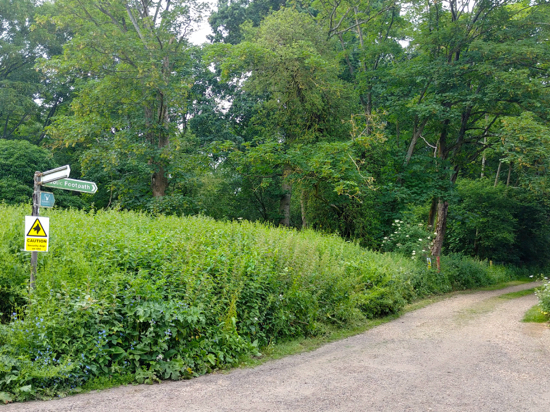 5: Continue walking towards the bend where Wildhill Road goes off to your left. 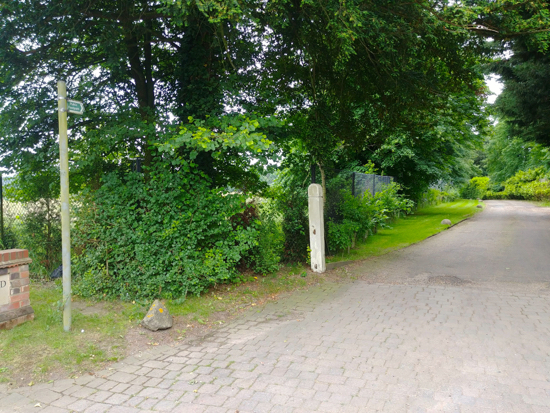 On your right is a private road heading south-east. 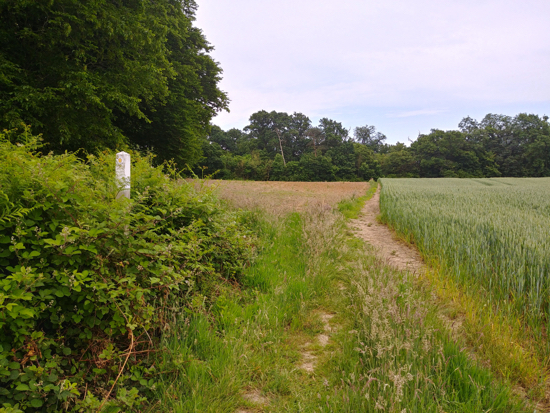 You will see a footpath sign where the road joins Kentish Lane. This is Essendon footpath 19. 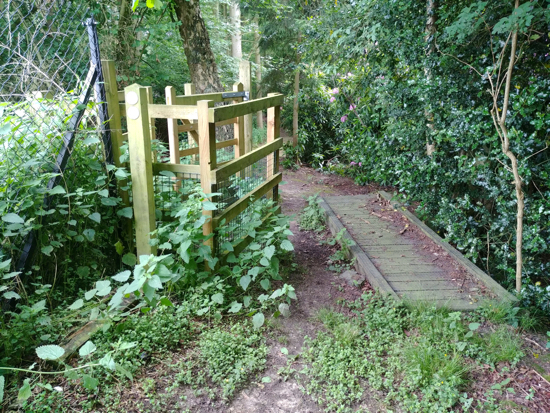 Turn right following this footpath as it continues down the private drive before branching off to the left to reach a small wooden footbridge with a wooden gate on your left. This is Essendon footpath 20. Go through the gate on your left and continue heading north-east with the field on your left and the woods on your right. 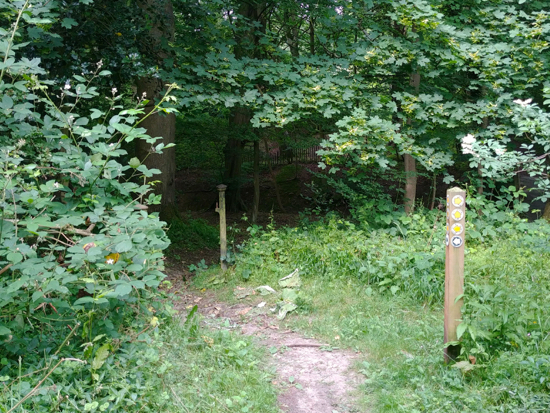 Just before you reach a house on your right you will see a gate on your right at the end of the woodland. 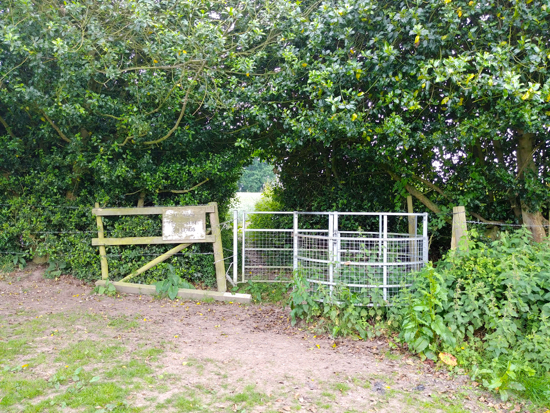 Go through this gate and, keeping the house on your right, continue walking north-east until you reach Hornbeam Lane (Essendon bridleway 18). 6: Turn left on Hornbeam Lane and walk north-west until you reach Kentish Lane again. Immediately opposite you will see another path with a house on the right. Take this track (Essendon footpath 15) and continue heading north-west until you reach a footpath sign. 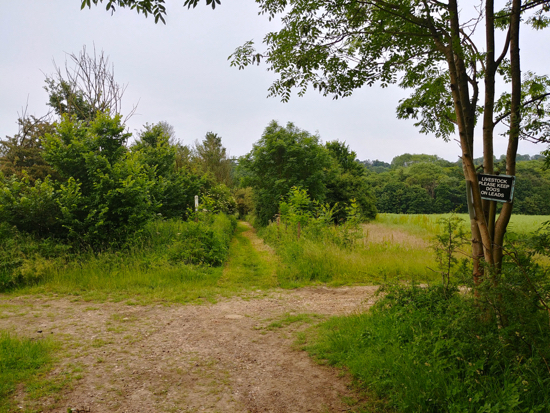 7: Turn right and head north-east through Duncan's Wood until the path opens out into a field. You will notice security warnings along this part and might hear the barking of security dogs. These have been introduced following a recent spate of poaching. I am assured the dogs are not running loose, but, rather, are taken on regular patrols on leads by security guards. Here there is a wonderful panoramic view of a small valley enclosed in woodland and formed by two brooks, the Essendon Brook and Wildhill Brook. 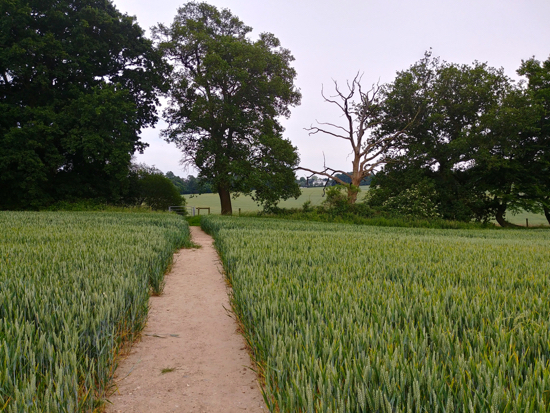 Your way continues forward along a sheltered track between the fields downhill until you come to a footpath crossing. Ahead is a small track down to a bridge over Essendon Brook, but your way is left along the edge of the woodland keeping the brook on your right. This is Essendon footpath 16. 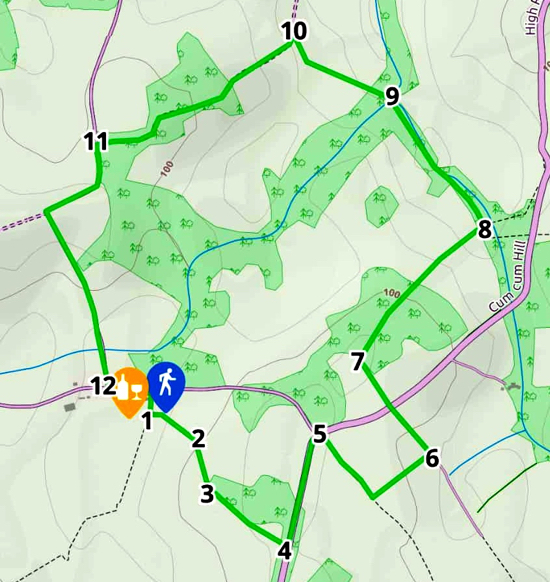 8: Keep going north-west along this path for approximately until you come to a small footbridge crossing Wildhill Brook where it meets Essendon Brook. 9: Cross the bridge and keep walking straight, climbing out of the valley with fields on your left and the hedgerow on your right. 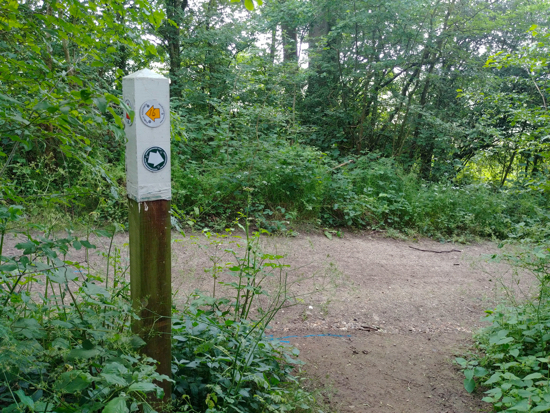 10: Your path merges with a byway open to all traffic (BOAT) at the top of the hill where you turn sharp left (This is Essendon BOAT 14) and follow this path round heading south-west until you reach West End Lane. As you walk this byway keep looking to your left, across the fields and the valley, and you will see the late Barbara Cartland's home, Camfield Place, perched high on the distant hill. 11: When you reach West End Lane, turn left and walk along the road as it winds its way down the hill into the village of Wildhill. 12: Turn left at the end of West End Lane and you will see The Woodman on your right.